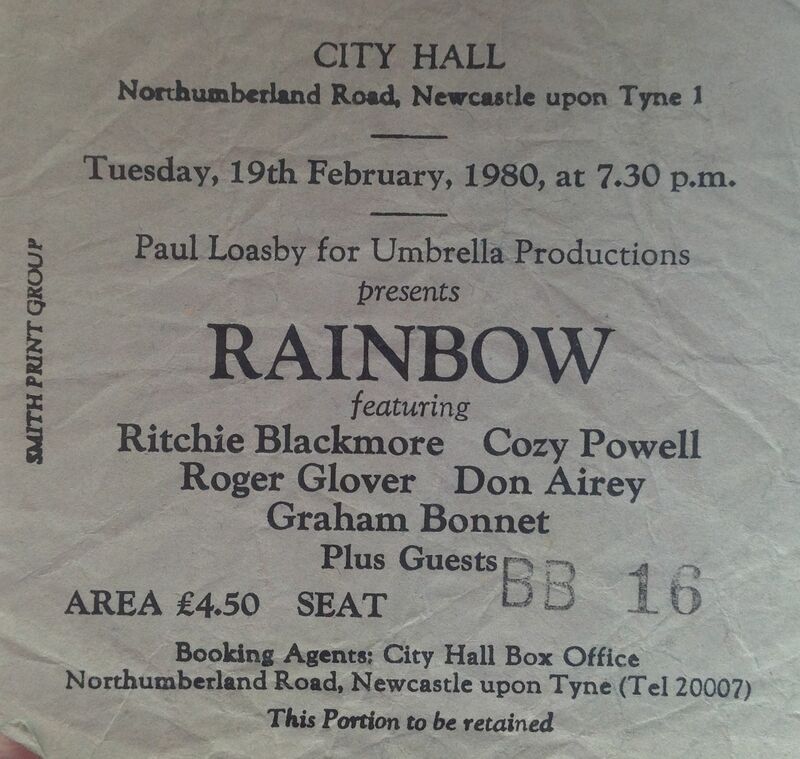 The next time Rainbow visited the North East it was to play in the cold and cavernous Whitley Bay Ice Rink, which was the venue of choice of bigger bands in the 80s, before Newcastle had an arena. This was now Rainbow MK VIIII (!) and the line-up was Ritchie Blackmore (guitar); Roger Glover (bass); Joe Lynn Turner (vocals); David Rosenthal (keyboards); Chuck Burgi (drums). Support came from ex-Runaway Lita Ford. Whitley Bay Ice Rink was a pretty awful venue for a rock concert. It held a lot of people but standing on top of an ice rink covered in wooden boards is not the best setting for a gig, and it was always soooo cold. However Rainbow’s performance made up for it. Ritchie was on excellent form, controlling his guitar and the band with strange almost magical hand gestures. A bootleg recording exists of the show. It was a long set by Rainbow standards, probably around two hours. Very loud and a storming performance. 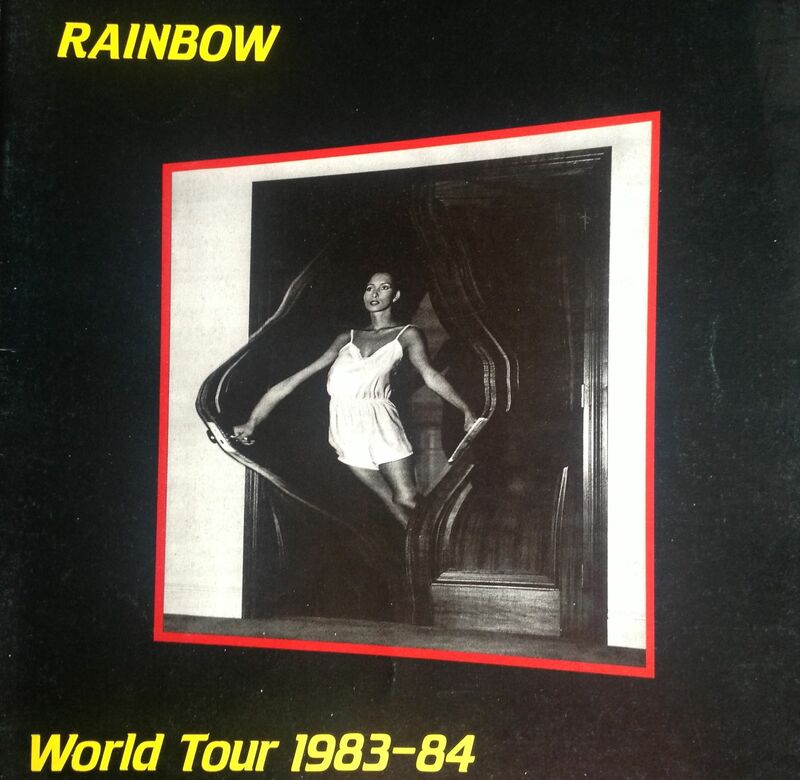 One of the best times that I saw Rainbow live. I think Ritchie’s strat was smashed into pieces, which he threw into the crowd, if I remember correctly. 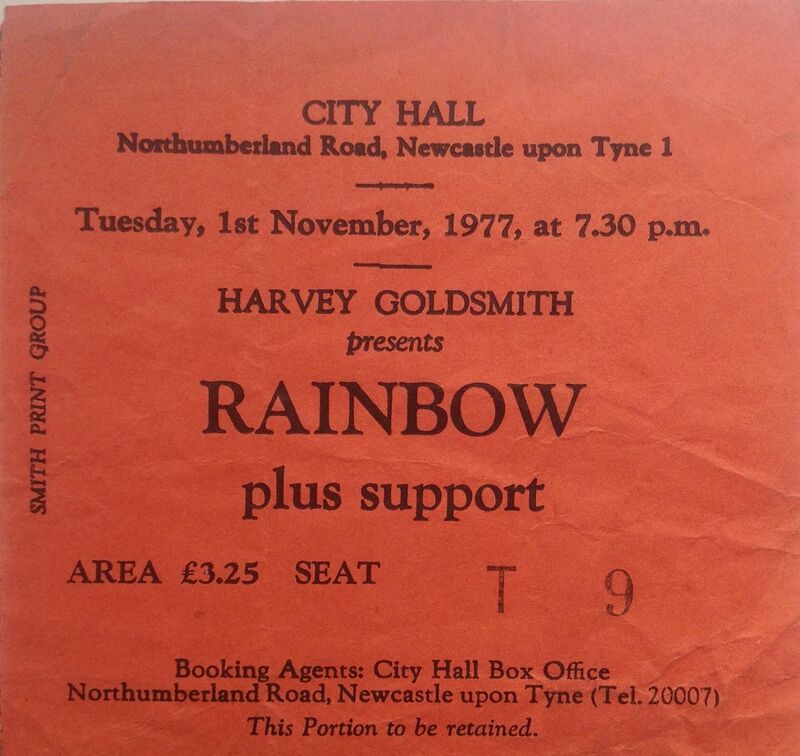 This was the last time I saw Rainbow. The next time I saw Ritchie it was back in Purple at their massive comeback show at Knebworth. 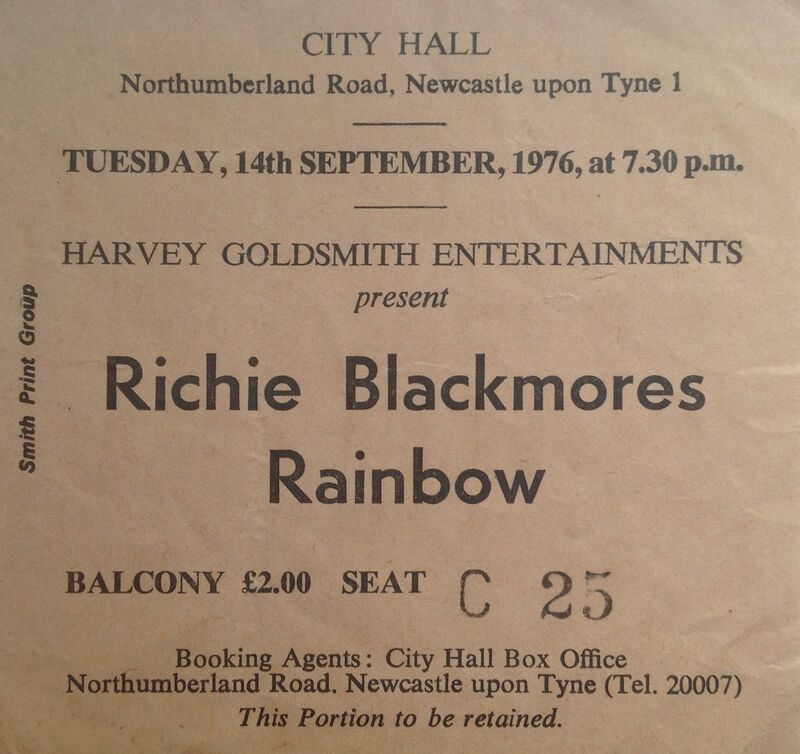 A year had passed since Ritchie Blackmore and Rainbow last graced the stage of Newcastle City Hall, and things had yet again changed in the band. Graham Bonnet and Cozy Powell both resigned to pursue other projects following a very successful performance at the first Monsters of Rock festival at Donington. The new line-up was Rainbow Mk VII and featured Ritchie Blackmore (guitar), Roger Glover (bass), Don Airey (keyboards), Bobby Rondinellu (drums) and Joe Lynn Turner (vocals). Their UK tour called at the City Hall for two nights, and I attended the first night, on 23rd July 1981. Support came from Rose Tattoo, an Australian hard rock and roll band, fronted by bald-headed and heavily tattooed Angry Anderson, who went on to major solo success with the power ballad “Suddenly”. I remember that there was quite a buzz about Rose Tattoo at the time, so I made a point of watching their set, and pretty good they were too. By now I was getting used to the ever changing format of Rainbow, and I’d heard the single “I Surrender” which gave the band another big chart success. Joe Lynn Turner was another great front man and vocalist and took the band even further in the direction of classic AOR and even bigger success around the world. This was another amazing performance by Blackmore and the band. Setlist: Land of Hope and Glory / Over the Rainbow; Spotlight Kid; Love’s No Friend; I Surrender; Man on the Silver Mountain; Catch the Rainbow; Can’t Happen Here; Lost in Hollywood; Long Live Rock ‘n’ Roll. Encore: All Night Long. It was now 1980, and Rainbow’s line-up had changed yet again. Blackmore had his eye on the commercial rock market, and wanted to move Rainbow’s music in the direction of more commercial straight ahead rock, away from their traditional “swords and sorcery” thematic. Ronnie James Dio was having none of this, so he was off, soon to join Black Sabbath. So the band morphed yet again. In came singer Graham Bonnet, last seen fronting The Marbles who hit the UK charts in the late ’60s with a Bee Gees penned pop classic “Only One Woman”. Bonnet has a great solid rock voice, with an amazing vocal range; although at the time I found it difficult to imagine anyone other than Dio singing Rainbow classics like “Man on the Silver Mountain”. But sing them Graham did, and he made a pretty good fist of it too. 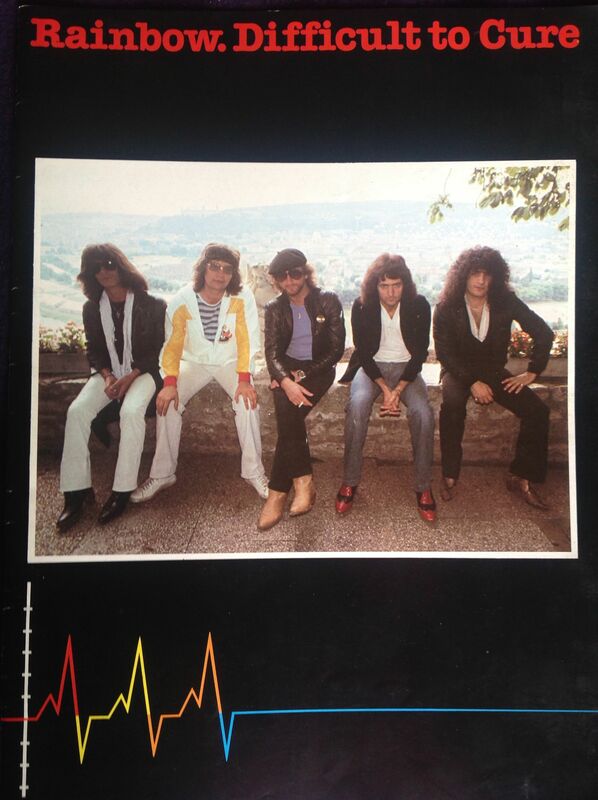 The line-up of Rainbow Mk V was Ritchie Blackmore (guitar), Cozy Powell (drums), returning old Purple mate Roger Glover (bass), Don Airey (keyboards) and Graham Bonnet (vocals). The changing nature of the band didn’t seem to impact upon their popularity. 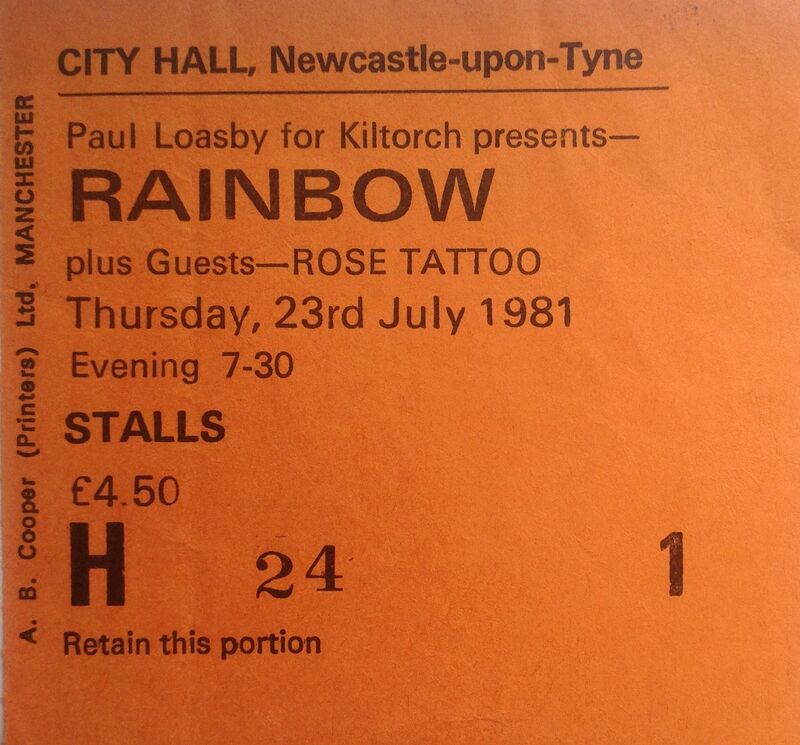 If anything Rainbow were more popular, and once again sold out two nights at the City Hall. I attended the first night’s concert. Support came from NWOBHM band Samson featuring Bruce Dickinson (or Bruce Bruce as he was then). This concert displayed more shades of classic rock than the mystical dark elements on show during the Dio-era. It was a different type of gig, but no less enjoyable, and Blackmore was as on-fire as ever. The new formula had already paid dividends in the form of a massive hit single “Since You Been Gone”, which was followed by the almost as successful “All Night Long”. Ritchie Blackmore and Rainbow returned to the City Hall in 1977 to promote their upcoming album “Long Live Rock ‘n’ Roll”. 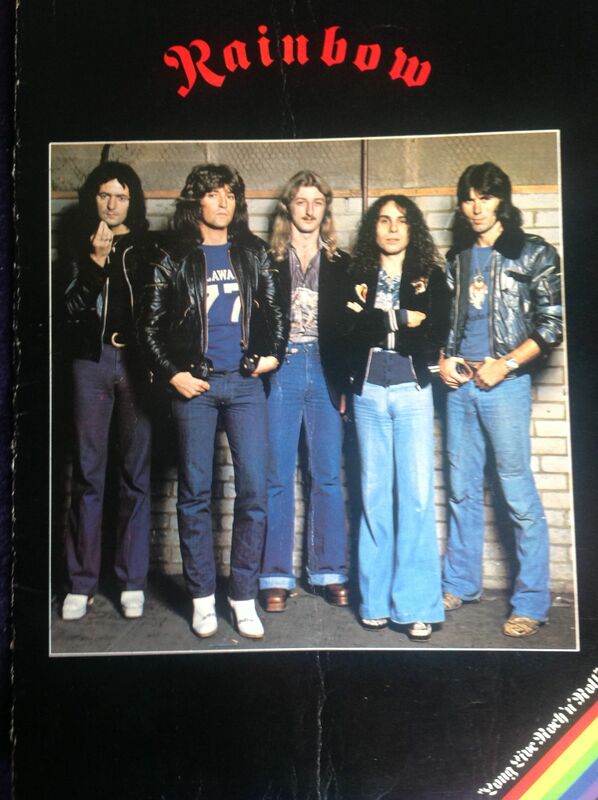 The ever changing line-up had evolved into Rainbow Mk4 and was now Ritchie Blackmore (guitar), Ronnie James Dio (vocals), Bob Daisley (bass), David Stone (keyboards) and Cozy Powell (drums). This time demand to see the band was massively high, resulting in two sold out performances at the City Hall. Support came from Kingfish. Once again, Rainbow put on an amazing show, with guitar pyrotechnics ala Blackmore, soaring vocals from Dio, and an amazing stage and light show. 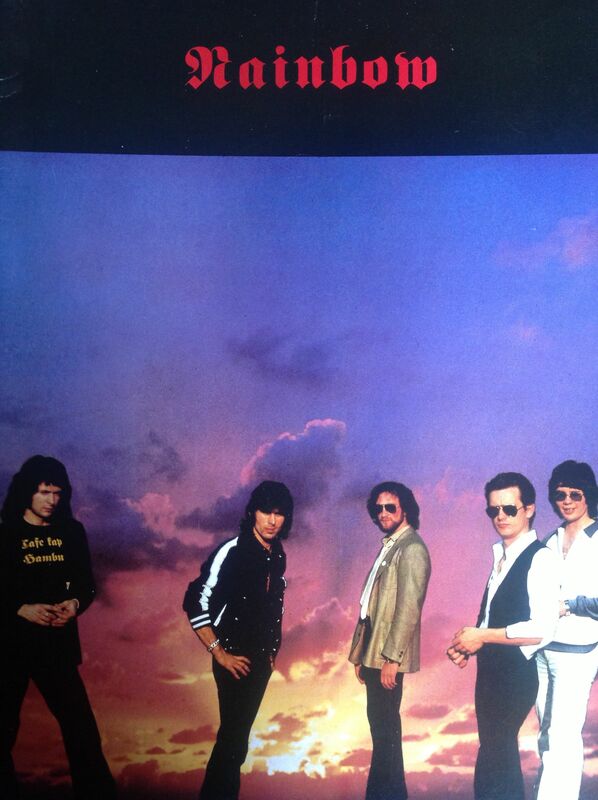 They just don’t make rock bands like this any more. Setlist: Kill The King; Mistreated; Sixteenth Century Greensleeves; Catch The Rainbow; Long Live Rock ‘n’ Roll; Lazy-Man On The Silver Mountain; Still I’m Sad. In 1975 Ritchie Blackmore was becoming disillusioned with Deep Purple, wanting to move their music in a different direction, drawing from his interest in classical music. He decided to try a few songs out with rock band Elf, fronted by Ronnie Jame Dio; Elf having supported Purple on the 1974 Burn tour. The liaison with Dio worked well and so Blackmore decided to leave Purple to form his new band Rainbow, although he was less than happy with the rest of Elf, and soon changed the rest of the line-up. By the time the band started to tour, and reached the UK; the line-up of Rainbow Mk2 consisted of Ritchie Blackmore (guitar), Ronnie James Dio (vocals), Jimmy Bain (bass), Tony Carey (keyboards) and Cozy Powell (Drums). Their first tour called at Newcastle City Hall on 14th September 1976. Support came from Stretch, a band that was fronted by Elmer Gantry (of Elmer Gantry’s Velvet Opera and “Flames” fame). Stretch developed from a band put together in 1974 with (according to them) help from Mick Fleetwood, to perform as Fleetwood Mac on a US tour. In the end Fleetwood dropped out (and denied any involvement) and they toured without him, but punters soon realised that the band contained no members of Fleetwood Mac and the tour collapsed. They subsequently had a hit single in 1975 with “Why Did You Do It?”,which was a direct attack on Fleetwood. Stretch were a pretty good rock band, who I saw a couple of times in the mid-70s. 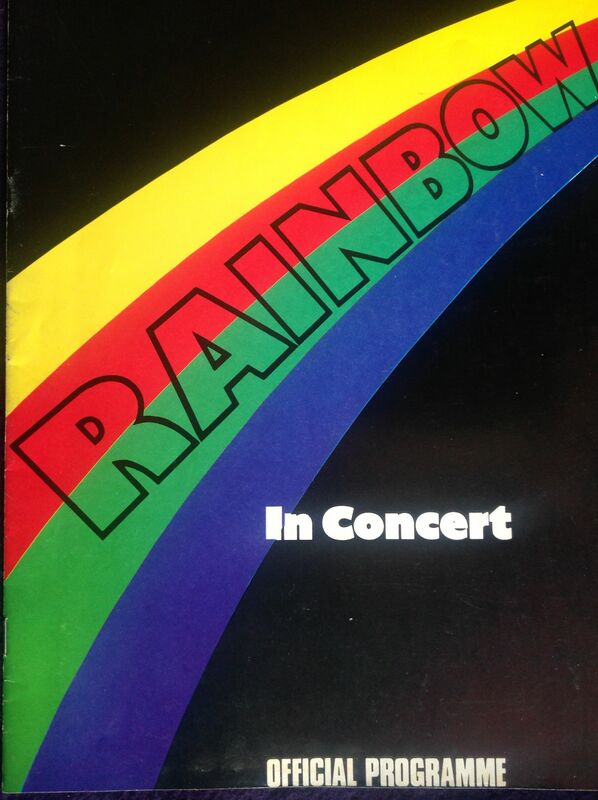 Rainbow concerts were tremendous events. The stage was surrounded by a massive rainbow which consisted of 3,000 coloured lights. And Blackmore was at the height of his powers in both guitar prowess and showmanship excess. He would climb on top of the stacks up and onto the balcony. I remember one show (I think it may have been this one) where he stood on top of a massive stack bashing his Strat against the side of the balcony, until it (the guitar that is) was totally demolished (I think it also left a few dents in the side of the balcony which had to be repaired afterwards). Of course we all cheered him on. Great stuff. Dio had an unbelievable vocal range, and added lyrics, and an atmosphere, of demons, goblins and mysticism to the proceedings. Their songs were excellent too: “Sixteenth Century Greensleeves”, “Man On The Silver Mountain” and “Stargazer” are classics from the time. 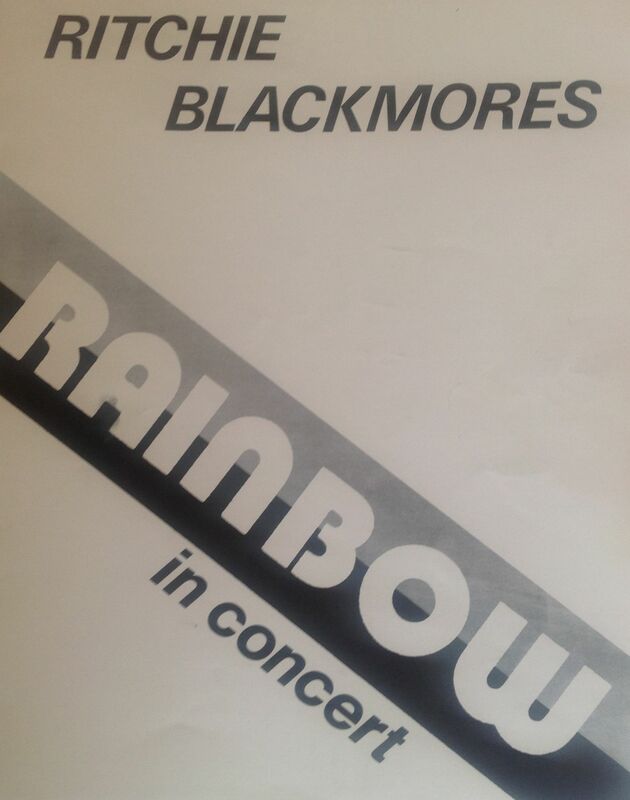 Blackmore retained “Mistreated” from his days with Purple. In the early days of Rainbow their concerts consisted of a relatively small number of songs, each one becoming an opportunity for epic jamming, particularly by Blackmore. The guy was amazing and his performance simply breathtaking in those days. Setlist: Kill The King; Mistreated; Sixteenth Century Greensleeves; Catch The Rainbow; Man On The Silver Mountain; Stargazer; Still I’m Sad; Do You Close Your Eyes. Note added 20th July 2014. I found the programme below in my collection. I guess it must be an unofficial programme which I bought outside the City Hall show in 1976.